Administrative/Biographical HistoryThe Eisingers were a Jewish family who lived in England and what is now the Czech Republic during and shortly after the Holocaust. The documents in this fonds pertain mostly to Bedrich Eisinger (birth name Fritz Eisinger, b. June 21, 1905, in Vienna, Austria) and his wife, Gerda Eisinger (birth name Gerda Sara Marcus, b. April 16, 1916, in Berlin, Germany). Bedrich Eisinger was born to Emil Eisinger (b. 1875; d. 1940) and Olga Brandweiner (b. 1877; d. 1942). He had two sisters: Marie Eisinger (b. 1903; d. 1903) and Clementine Eisinger (b. 1908; d. 1939). Bedrich left Austria for Palestine in 1938. He returned in 1939 to join the Czechoslovak Army and served in Britain and overseas. He worked primarily as a driver in the army, and continued to work as a driver after the war. Clementine died in London, England, in March 1939. Emil died during the war, on July 16, 1940, in Vienna. Olga died April 9, 1942, in Maly Trostenets extermination camp in what is now Belarus. Gerda Eisinger was born to Arthur Marcus (b. November 20, 1887; d. 1939) and Jenny Ruda (b. January 4, 1888). Her sister, Sigrid Marcus, was born in 1920. After her father died in April 1939, Gerda decided to leave Germany. In June 1939, she went to England to work as a domestic servant with the hope her mother and sister would follow her. Unable to emigrate, Jenny and Sigrid went into hiding with the help of Christians Fritz and Emma Pally. During air raids, those in hiding were unable to hide in shelters and were left very vulnerable. Jenny and Sigrid, believing it to be the safest option, moved to the Berlin ghetto. In the beginning of 1943, they were transported to Auschwitz where they perished. In 1940, Walter Pally, the son of Fritz and Emma Pally, was captured by the British while working as a radio operator aboard passenger ships in Manchuria. To help him avoid being interned, Gerda married him in England, on March 2. However, he was placed aboard the Arandora Star to be interned in Canada. Walter survived the ship’s sinking in July 1940 and was transported to Australia soon after. In May 1940, shortly after Germany invaded the Netherlands and Belgium, Gerda, though classified by the British government as a “refugee of Nazi oppression,” was interned at the Isle of Man. Gerda met Bedrich shortly after her release in 1941, while staying at the Koshinsky’s family home in England. Their daughter, Barbara Eisinger (birth name Renate Barbara Eisinger), was born December 13, 1944, in Birmingham, England. Bedrich and Gerda married in Birmingham in 1945, after Gerda’s first marriage was annulled. After the war, the Eisingers lived in Teplice-Sanov, Czechoslovakia. From 1947 to 1949, they lived in Vienna and from 1949 to 1950 they lived in Germany. While in Germany, Bedrich was classified as a displaced person by the International Refugee Organization and lived in various displaced persons camps. After returning to England for two years, the family moved to Canada. From 1952 to 1966, the Eisingers lived in Montreal, Quebec, Canada. In 1966, Bedrich and Gerda moved to Vancouver, British Columbia, where Gerda worked as a typist. Bedrich died January 12, 1980, in Seattle, Washington, United States. Gerda died September 2, 1988, in Vancouver. 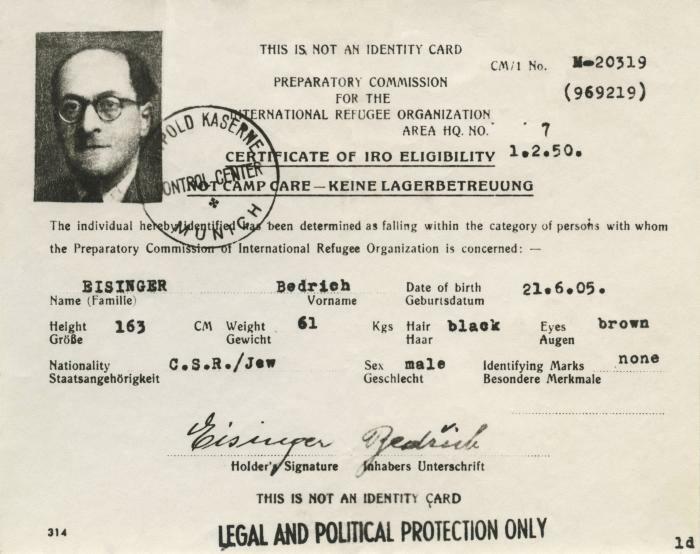 Scope & ContentCard issued by the Preparatory Commission for the International Refugee Organization belonging to Bedrich Eisinger qualifying him for refugee status.